ON TUESDAY THE 8TH OF SEPTEMBER, 2009,AT ABOUT 1:30 AM, A YOUNG GIRL WHO APPARENTLY APPEARED TO BE A PROSTITUTUTE WAS STABBED IN THE APARTMENT OF MR. MICHAEL MCTIGHE THE MANAGING DIRECTOR OF ARIK AIR LIMITED. 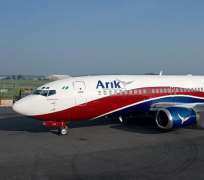 THE RANDY MANAGING DIRECTOR WHO REPUTEDLY SLEEPS AROUND WTH THE ARIK AIR FEMALE CABIN CREW AND CONSTANTLY IN THE COMPANY OF CALL GIRLS AT THE HOUSE J RESORT IN GRA IKEJA WAS SAID TO HAVE BROUGHT HOME WITH HIM ON THIS FATEFUL NIGHT 3 PROSTITUTES TO HIS APARTMENT AT NO 74 ODUDUWA CRESENT IN IKEJA GRA, A PRIVATE GUEST HOUSE MAINTAINED BY ARIK AIR LIMITED WHERE THEY HOUSE SOME OF THEIR TOP OFFICIALS AND PILOTS. IT WAS REPORTED BY AN ANANIMOUS SOURCE THAT A LOUD COMMOTION AND SCREAMING ALERTED THE OTHER OCCUPANTS OF THE GUEST HOUSE WHO RUSHED TO THE MANAGING DIRECTOR'S APARTMENT ONLY TO FIND ONE OF THE THREE GIRLS LYING UNCOUNCIOUS IN A POOL OF HER OWN BLOOD. CLOSE EXAMINATION DISCLOSED THAT SHE HAD BEEN STABBED AND SUSTAINED A FATAL WOUND IN HER STOMACH.SHE WAS THEN RUSHED TO THE GENERAL HOSPITAL IKEJA WHERE THE DOCTORS INITIALLY REFUSED TO TREAT HER AS THEY INSISTED ON GETTING A POLICE EXTRACT BEFORE ATTENDING TO HER CONSIDERING THE EXTENT OF HER INJURY. WE ARE PRESENTLY WAITING FOR FURTHER INFORMATION ON THE STATE OF THE YOUNG GIRL'S HEALTH. AS OUR SOURCE GATHERED, MR MICHAEL MCTIGHE HAD PROPOSED TO THE INJURED YOUNG LADY WHO CAUGHT HIM WITH TWO OTHER GIRLS IN HIS APARTMENT. THE QUESTION HERE IS HOW SAFE ARE OUR DAUGHTERS IN OUR OWN COUNTRY IF A FOREIGNER CAN STAB A YOUNG GIRL AND GET AWAY WITH IT. MOTHERS DO YOU HAVE A YOUNG DAUGHTER WORKING WITH ARIK AIR? HOW SAFE IS SHE FROM THIS MONSTER MICHAEL MCTIGHE?